Fly into Calgary and head to Banff. 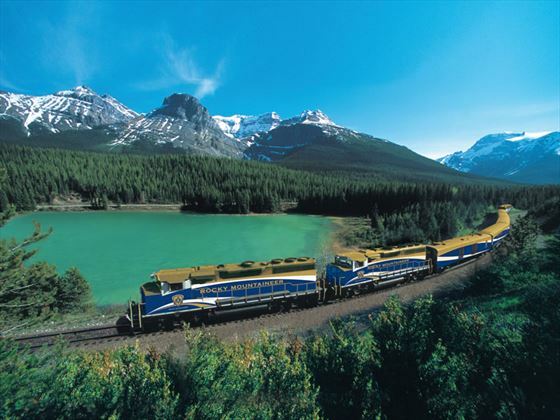 You will travel the Icefields Parkway to Jasper taking in Lake Louise on the way before joining the Rocky Mountaineer for a two day train trip to Vancouver. After 2 nights in Vancouver you will join the Holland America ms Volendam, which cruises along the Inside Passage, past countless islands and fjords to icy Alaska. 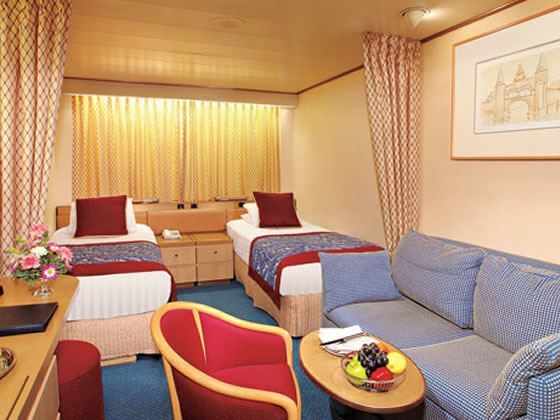 This is a tailor made itinerary and any hotels can be changed should you wish. 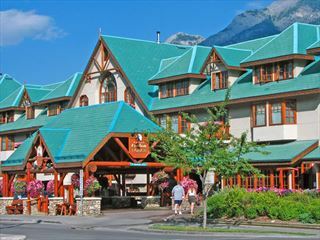 Fly to Calgary and take an included scheduled transfer to your hotel Banff for 2 nights. Rest of the day is at leisure. Day at leisure in Banff to explore independently or we can arrange sightseeing for you. 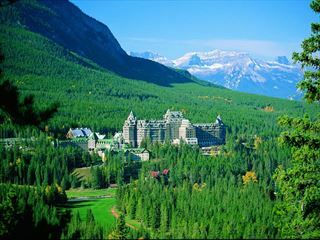 Highlights include Banff Gondola, Banff Springs and the Fairmont Banff Springs Hotel. Banff has a good selection of shops, bars and restaurants to enjoy. 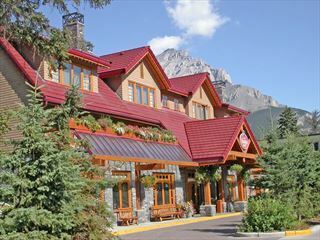 Today you check out of your hotel in Banff and for a one way full day sighseeing tour Jasper. Travel the Icefields Parkway through the natural splendour of Banff and Jasper national parks. Spectacular glaciers, cascading waterfalls, turquoise lakes and colourful meadows dot this awe-inspiring mountain wilderness. 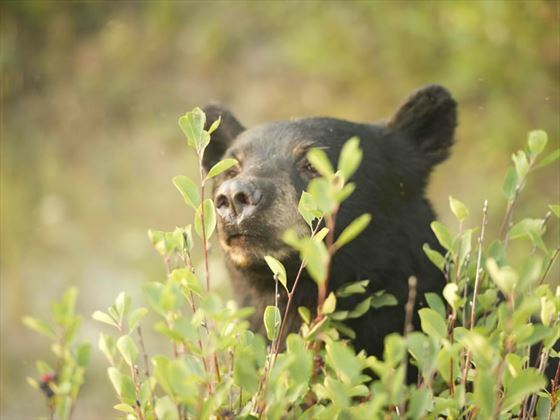 The snow-capped peaks and endless mountain ridges are home to a wide variety of wildlife, including bears, wolves, deer and eagles. The tour stops at the Columbia Icefield where you will venture by Ice Explorer onto the massice Athabasca Glacier. Other brief sightseeing stops include an opportunity to photograph the turquoise waters of picturesque Lake Louise. 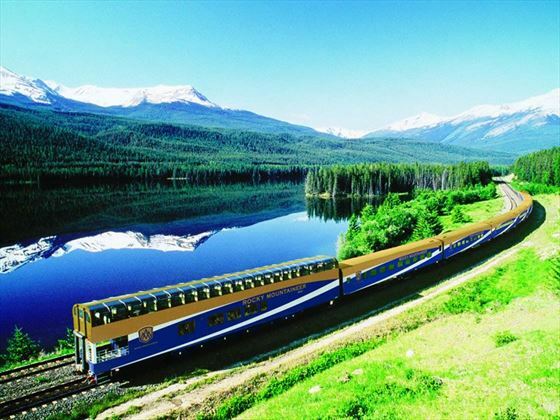 You finish the tour at your hotel in Jasper located next to the train station. Mountains. 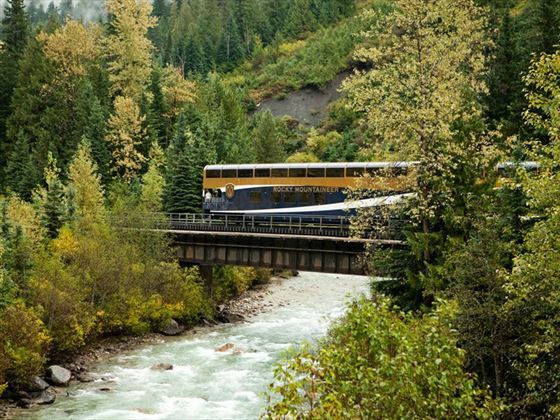 Today’s highlights include Mount Robson, Pyramid Falls, the climb over Yellowhead Pass, and the journey along the North Thompson River as you approach Kamloops. Your journey continues west towards the Pacific Ocean and the coastal city of Vancouver. 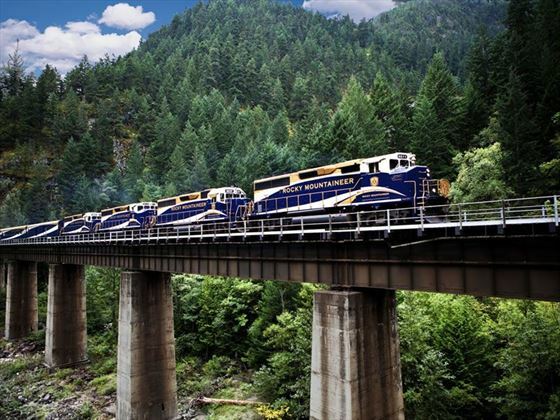 On today’s journey you will again see dramatic changes in scenery, from the desert-like environment of the Interior, through winding river canyons and pristine forests, to the Coast and Cascade Mountains and the lush green fields of the Fraser Valley. Highlights include the steep slopes and rock sheds along the Thompson River and the rushing waters of Hell’s Gate in the Fraser Canyon. Your rail journey ends on arrival in Vancouver this evening. Transfer Independently from the train station to your hotel. B, L.
Time to enjoy the cosmopolitan city of Vancouver at your leisure. Vancouver has a stunning setting on a natural harbour, with a mountainous backdrop. As well as excellent shopping there are plenty of attractions to explore. 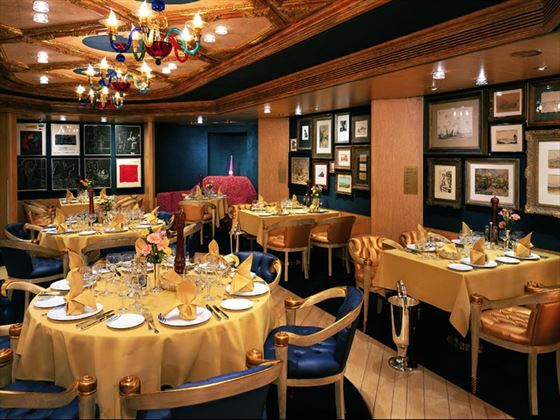 Transfer independently today to the cruise terminal to join Holland America’s ms Volendam. Nestled between 3,000-foot high granite walls, the narrow, twisting slice of ocean called Tracy Arm Fjord weaves through the Tongass National Forest for roughly 35 miles. The shoreline is spotted with waterfalls created by melting snowcaps and trees sprouting at odd angles from rocky outcroppings. The dramatic Sawyer Glaciers at the end of Tracy Arm are framed by mountains on either side, and are often bathed in a light mist that amplifies the blue hue of the ice. The glaciers also are home to black and brown bears, wolves, deer and moose, and seals and whales make their home in the fjord’s icy waters. No roads lead to Juneau, which gives the Alaskan capital a misty inscrutability. You need to come by air or water, but when you arrive, the place will delight you with its bounty of water, forests, and mountains. 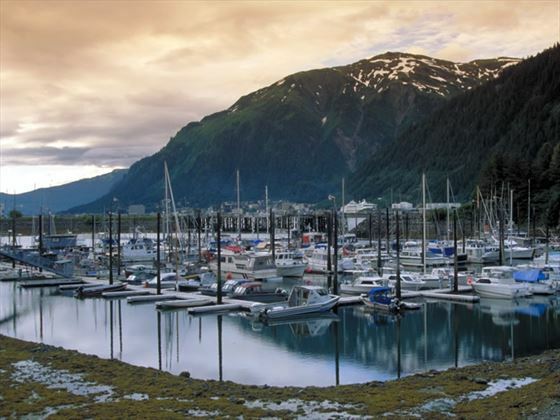 Squeezed between the Gastineau Channel and Coast Mountains, Juneau offers a lot of variety in close proximity. The massive Mendenhall Glacier and the immense Juneau Icefields are at its back door. The vast Tongass National Fores stretches away to the northeast. You can shop downtown or get out and kayak, dogsled, raft, hike, whale watch, flightsee or fish. The adventures are as bountiful as the daylight. Some of the aspiring Klondike gold rushers who made it to Skagway took a look at the 500-mile journey that still lay ahead of them and decided a change of profession was in order. So many of them set up shop as provisioners that Skagway was the largest city in Alaska by the end of the 19th century. Booms fade and dreams move on, but the glory days still reverberate through the town. Ride the antique White Pass & Yukon narrow-gauge railway, step into the Red Onion Saloon or peruse the restored buildings and wooden boardwalks of the Klondike Gold Rush National Historic Park. 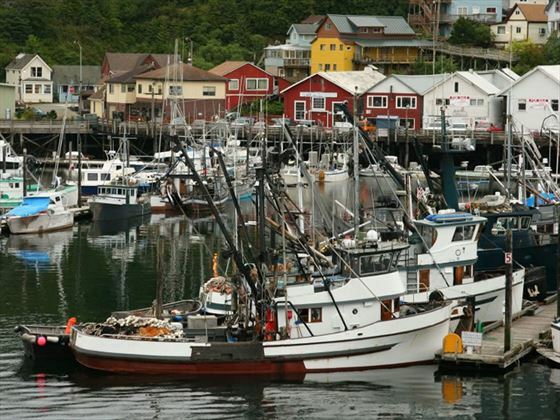 Ketchikan clutches the shores of the Tongass Narrows, with many shops and houses built right out over the water. The stairways are weathered and the vibe is cheerful in the town that calls itself the Salmon Capital of the World. 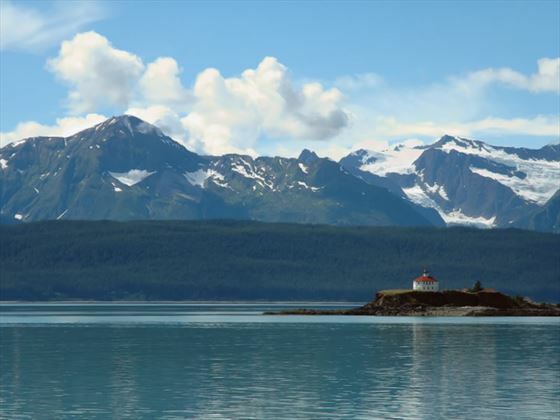 Besides the main attractions – Creek Street, the Tongass Historical Museum, Totem Bight State Park and Saxman Village – try a flightseeing trip to Misty Fjords National Monument. These deepwater fjords were gouged out by retreating glaciers, leaving granite cliffs towering thousands of feet above the sea and countless waterfalls plunging into placid waters. 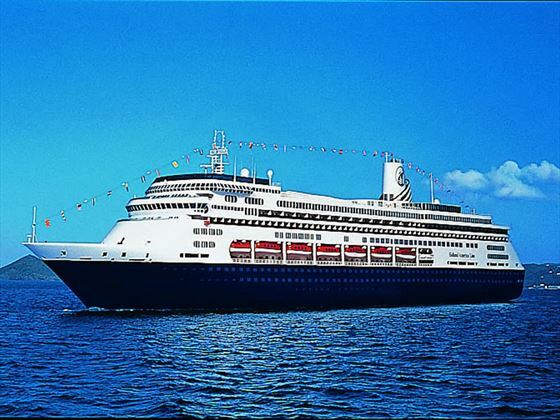 After breakfast you will disembark the ms Volendam in Vancouver, where your holiday concludes. Transfer independently to the airport for your flight home. Scheduled Coach Transfer from Calgary Airport to your Banff hotel. 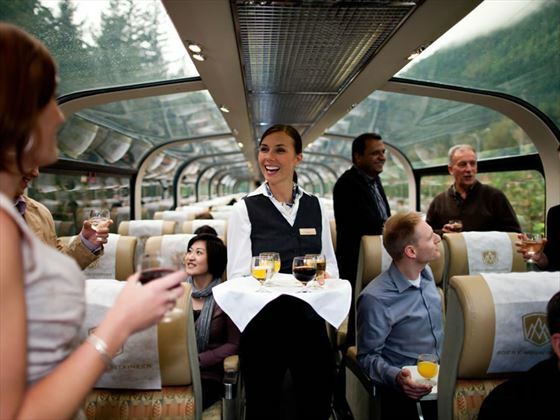 Transfers from hotel to Rocky Mountaineer station in Jasper; Vancouver train station to hotel; hotel to cruise port and port to airport.